For nearly 30 years the Tacoma Weekly has published every seven days without fail. We don’t make money from subscriptions or by charging our readers any sort of fee because we feel that the news should be free and available to everyone. 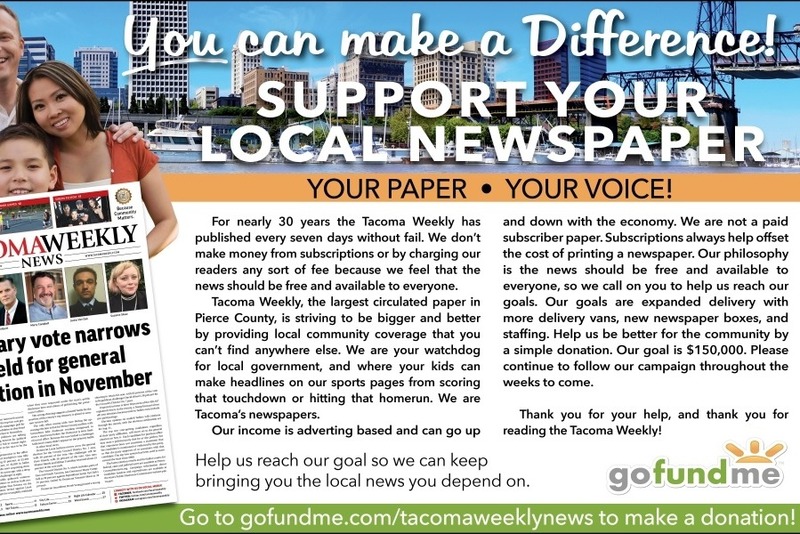 Tacoma Weekly, the largest circulated paper in Pierce County, is striving to be bigger and better by providing local community coverage that you can’t find anywhere else. We are your watchdog for local government, and where your kids can make headlines on our sports pages from scoring that touchdown or hitting that homerun. We are Tacoma’s newspapers. Our income is adverting based and can go up and down with the economy. We are not a paid subscriber paper. Subscriptions always help offset the cost of printing a newspaper. Our philosophy is the news should be free and available to everyone, so we call on you to help us reach our goals. Our goals are expanded delivery with more delivery vans, new newspaper boxes, and staffing. Help us be better for the community by a simple donation. Our goal is $150,000. Please continue to follow our campaign throughout the weeks to come. Thank you for your help, and thank you for reading the Tacoma Weekly!